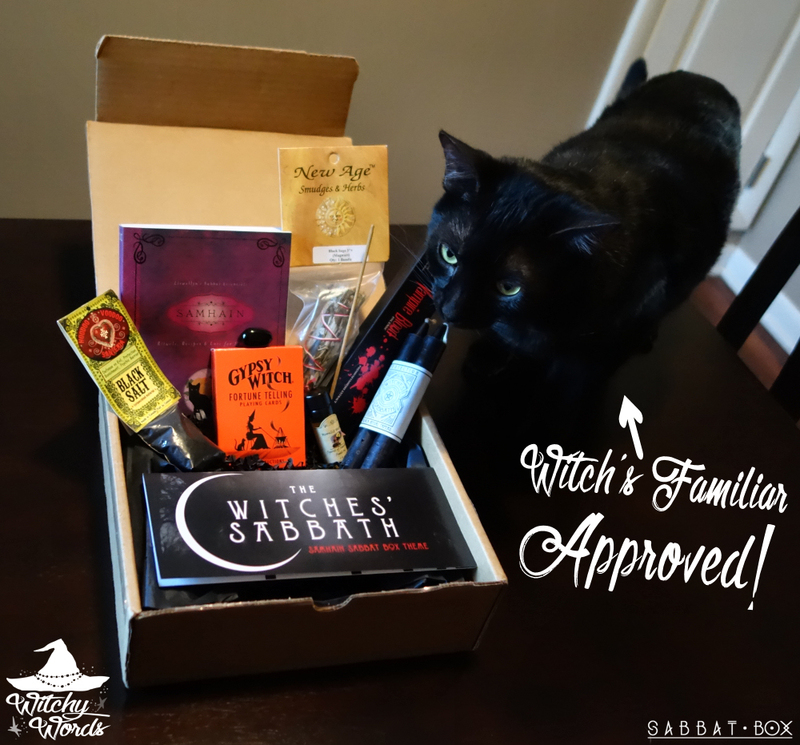 Sabbat Box appears on our doorstep once again! If you haven't heard, Sabbat Box is like Loot Crate for pagans, offering sabbat-related goodies from pagan-owned small businesses two weeks before each holiday. This subscription box service is perfect for the beginner and advanced pagan alike, often including items that can be used not only for the sabbat at hand but many holidays and esbats to come! Here's what you can find inside the Samhain box, with individual items offered in Sabbat Box's store. If you see something you like, check out the link for more details! Of course, the Samhain box includes Llewellyn's Samhain book by Diana Rajchel. These little books are super handy for beginners, and include rituals, spells, recipes and lore for each holiday. It's always wonderful to have a great little reference to start your sabbat off right! ... The stick incense provided inside is top notch. The included pamphlet notes that the incense includes vanilla, musk, sandalwood, benzoin and dragon's blood, and the combination of these makes for a strong but delightful scent. We're already burning it here at Terra Luna and greatly enjoy it, but incense can also be perfect for ritual as well. Use the smoke to cast your circle, empower tools and add energy to your work. Important themes for Samhain include the thinning of the veil, which means you want cleansing and protective items to aid you through this time. Black salt by Charme et Sortilege is the perfect protection aid. Salt itself has strong protection properties, but black salt is made with additional burnt herbs and charged for a strong protection barrier. You might utilize this around your circle in ritual or across your front door on the night of Samhain to keep unwanted spirits out. Also on the protection side is this gorgeous black obsidian chunk offered via Azure Green for each Sabbat Box recipient. Black obsidian is the shielding stone, known for its protection against psychic attacks and negative energies. It's also great for grounding. Keep this little guy on your person during Samhain and you're sure to make it through the night of spirits. A sage bundle via Sabbat Box's sister store, Eclectic Artisans, is also included in this holiday's box. Sage bundles are typically used for smoke cleansing, and cleansing is perfect for starting off your New Year right. This sage bundle isn't your standard white sage, however. It's made instead of black sage, also known as Mugwort, which gives it a bit of a kick. In addition to cleansing, Mugwort enhances psychic vibration and clairvoyance, if that's part of your worldview. That makes this particularly relevant to the holiday where the veil is thin and divination is high priority. Sabbat Box has you covered if you don't have a divination tool available by providing this fortune telling card set by US Games Inc. A word of caution that g*psy is typically considered a racial slur against the Romani people. A Romani friend of mine gave me a deck of these some years ago. She seemed pretty comfortable with its usage, particularly as part of the reclamation trend, but that's one and not all. I certainly wouldn't use the term in every day language and probably won't name the cards in text. All of that being said, the cards themselves work like a deck of playing cards, but include additional artwork and meanings for each card. Each card has a meaning that fluctuates with its proximity to other cards in the deck on a layout. The instructions encourage you to do elaborate setups that use the entire deck and take extensive interpretation, so make sure you have plenty of time and quiet to do a full, proper reading. Because the proximity is the key feature, I found that standard reading spreads, like the Celtic cross, don't work for this deck. At least, not for me. But if you can make it work, go for it! Because the veil is thinnest on the night of Samhain, these pair of black tapers offered by Sabbat Box itself are great for lighting your way. One of the hardest things to find, unless you make them yourself or purchase them from specific stores, is all-black tapers. Oftentimes, tapers and pillars that are black are simply coated, and the internal wax is white. But these tapers are made the right way and with you as a witch or pagan in mind! Sabbat Box suggests to use these to "illuminate your sacred space, for a quick spell, or to place upon your window sill to guide the spirit of your ancestors home during Samhain." I think they'd be fantastic for any of those. You can even carve symbols, words or a name on the candle depending on your use! If you're thinking of using the tapers, why not anoint them with the included Spirit of Samhain Spell Oil by Moonlit Herbals? This oil is blended in organic Safflower oil and includes a variety of herbs, flowers, oils, resins and even crystals that you can visibly see at the bottom of the vial. If you do choose to anoint your candle, remember that rubbing the oil from the top to bottom attracts and from bottom to top projects or banishes. After you anoint your candle, you can even roll it in relevant herbs! If you don't want to anoint your candles, this oil has a variety of uses, such as ritual baths, crystal dressing, sachet anointing and more. Though safflower oil is typically safe for all skin types, I strongly suggest using a cautious dab on your arm just to be sure you don't have a reaction before proceeding forward with any major coverage. Sabbat Box also always includes some goodies, such as discounts to amazing online stores and, this time around, a little candy goody for your Trick-or-Treating self. If you're ever unsure of a sabbat or the contents of the box, Sabbat Box always includes a tri-fold pamphlet with correspondences and details about the holiday as well as why each item in the box was chosen! Overall, I was quite pleased with Sabbat Box's items for Samhain. The box sticks well with the theme of the holiday and offers a variety of items that would be useful not just for the night the veil is thinnest, but for many months to come! You can be sure you'll see some of these items pop up during the Circle of Fountains Samhain ritual. 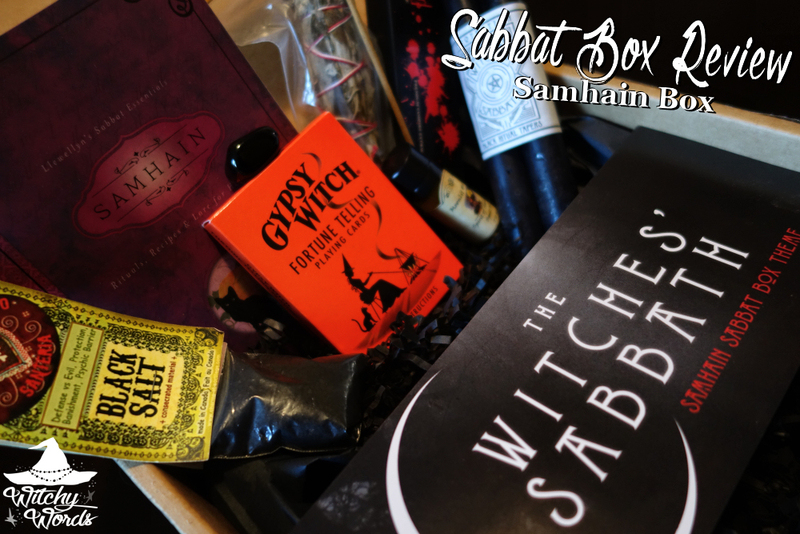 Want to try out Sabbat Box? Click here to get on the waiting list! Another amazing selection! How sweet of them (no pun intended) to add in the Halloween candy. I'm hoping they have an opening soon! My wife and I have been eyeing a Sabbat Box subscription for quite some time, and we delayed signing up so as to (hopefully) receive our first box for Samhain. Needless to say, we were disappointed when we visited the site several weeks ago only to find that we were relegated to a waiting list. I'm looking forward to receiving one soon, but I really wish we could have gotten started right away. Either way, it looks like a great spread, and every box I've seen so far has been full of amazing products, so I know when we finally do get on the guest list we'll be thrilled with our purchase. What a great idea!! I never knew about these and will be looking at purchasing them!